I love outdoor Latin American markets. You can get nearly anything. Fruits and vegetables; used books; clothing and shoes; old postcards; spices; sunglasses; art; toys; and, for tonight, fireworks. Old men with reedy voices sit on folding chairs. Hip young couples stroll with a thermos of hot water hugged in the crook of an elbow and a maté cup with a silver straw in hand. Families push strollers. Recorded tango music flows on one street, and the next brings a cacophony of bird chirps from birds for sale. And the sun and breeze washes over everyone. As I was walking, I thought about the New Year when I lived in Ecuador. Water bombs and water were dumped off roofs and out of windows on unsuspecting bypassers. And viejos were created from straw or papier mache...figures of politicians and others that were burned at midnight on New Year's Eve. Both this and the calendar pages are a letting go of the old year, letting it pass to get on with the new one. The marido and I had a conversation about whether people know anything about Uruguay. I don't. All I've learned was between the airport and the hotel. Montevideo is the capital. Don't ask me more! We got on the plane in Buenos Aires, and it was hot. Not a little hot. A lot hot. Parents were taking clothes off their little kids and babies, putting water on their bodies and fanning them. The flight attendant said until we had clearance to land in Montevideo, they couldn't turn the engines on, and until the engines were on, the AC couldn't go on. On to a city bus to go to the hotel with my big backpack and no seat on the bus. The driver was bad too, throwing everyone around and out of their seats. Not fun. But now we're here. There are daytimer and calendar pages all over the sidewalks. I think it must be an end-of-year thing--rip all the pages out of last year's calendar and toss 'em up in the air or out the window. I'd whip my pages out of the hotel window if I had my calendar here, just to get into the spirit of things. Today did some great hiking in the Tierra del Fuego National Park. Really nice. Big beach glass day. My jeans pockets are sagging here in the cyber cafe. (Not to mention that it´s good to be heading to warmer places soon, since my jeans are about ready to stand up on their own.) The park is a bird watchers paradise. And there are bunnies by the hundreds (or maybe thousands)--black, cottontail, brown. They´re all here in force hopping ´round. It was so wonderful, we may go back tomorrow to do more hiking. Unfortunately, the zippy l´il camera broke. We´ll look at a cheap digital in Duty Free in Buenos Aires in a couple of days on our way to Montevideo (Uruguay). So I made it about 7 miles trekking in one day after all. This is the Fitz Roy peak, which cleared for a few brief moments for a photo. In honor of my mini-trek, had my photo taken next to the town's sign in Chalten, which notes it's the Capital Nacional del Trekking. To come: Colony of sea lions...going tomorrow. It’s inevitable when traveling to hit a low point. We arrived in El Calafate, Argentina, by bus today. It’s a charming town with artesanal chocolate and ice cream, bakeries, cafes and coffee shops. Dogs wander the streets and flop in front of the doors of tour agencies, bookstores, and stores with Gore-Tex gear and hiking boots. I’m overwhelmed, though, by the options, and much of what’s here is set up for trekkers. I am in mid-life and not fit for trekking. The young and fit gather supplies, and I feel woefully inadequate and, well, old. Shorter hikes are OK, if not too much altitude is involved, but trekking, nope. My marido’s idea of a vacation is to keep busy, to leave at 8:00 every morning for hiking or sightseeing. Up and at it. Mine is a little slower. I like to take it easy. Sleep in. Read books. Watch the world go by from a café or park bench. So sometimes we compromise. This trip is different from others because I’m not working, and usually when I’m out of the U.S., I am. The next few days are shaping up to be a short hike (2 hours over rocks) to a really incredible glacier, and then a couple of days for him to do some serious hiking and me to put my feet up and read a novel. It’s hard to come to terms with aging, especially, when in my mind, I’m not much older than the trek set. But in reality, I am, and it’s sometimes hard to come to terms with that. Two days at Torres del Paine National Park in a rented Nissan 4 x 4, avoiding cows being herded down the road. Snow-capped peaks. Pink flamingos in an icy lake. 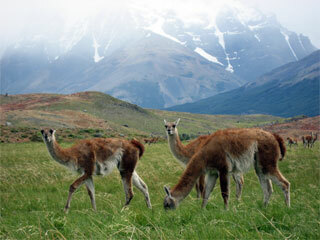 Guanacos (see photo) grazing along the road. Blue icebergs. Andean condors. Waterfalls. It´s cold so in a fit of ingenuity, I knit myself a headband ear muff and sewed it together using a tweezers since I didn´t have a needle. Tomorrow we cross from southern Chile to southern Argentina. I am a happy woman when my pockets are heavy with shells or rocks or sticks. Today, while I waited for a ferry to Magdalena Island, I filled my pocket with beach glass. White and green. Glass tumbled in the sea. We boarded the ferry to head through the Strait of Magellan for the 2 hour trip to the island, finding a place on the floor of the deck outside to sit and watch the waterscape. For a short way, two dolphins swam alongside the boat. There were thousands of penguins on the island. On the rocks by the beach. On the grass. In their burrows (who knew they burrowed like gophers?). With their fluffy gray youngsters. Swimming in the water. Always looking like with one wrong step, they will tumble over. It’s not a good idea to touch them because they can bite, but they turn their heads back and forth, sort of like dogs do when they’re trying to listen. So, if you look one in the eye, and tilt your head left and right, the penguin will swivel and twist his neck in the opposite direction. When things are going well, you can both be tilting back and forth for a while, until one of you gets tired. It got dark around 10:45 tonight. Tomorrow we go on a tour to a fort, but what I’m really looking forward to later in the day is a trip to the cemetery. Madison, WI: The Something to Say Blog Management Group has legally abdicated all responsibility for regular posts during Lucia’s said vacation to Chile, Argentina, and Uruguay, and takes no responsibility if she strays into Paraguay or other parts unknown. Something to Say Founder Lucia was unavailable for comment, citing pre-travel responsibilities. I've always thought of marigolds as lowly annuals my mother planted as borders. A common, humble, dull, pathetic flower. A flower to be planted in straight lines in the summer garden. Traveling has changed the marigold for me. I can now see the richness of its color and its beauty in a garland. In India and Nepal, offerings of marigolds fill shrine niches and drape figures of Hindu gods. Marigold garlands, both fresh and dried, hang in swags on houses and businesses. They collect in the cracks on the streets, adorn weddings, and accompany the dead. Day of the Dead altars in Mexico are strewn with marigolds. Symbols of grief and prosperity. And I read that early Christians placed marigold (Mary's Gold) garlands near statues of the Virgin Mary. While I'm stepping through the snow in my back yard, I'm looking at the garden. Next summer, I'm going to plant lots of marigolds. I spent a good half hour this morning dancing. To Mike Doughty and John Mayer. I had a good time. When I was a girl, I danced endlessly around the house. This was not encouraged by my mother...or my father. How could this girl who dances be theirs? After me, they had sensible sons, who collected baseball cards and could fix things. It’s very simple really. I have a good sense of dance. And watching others dancing for a few minutes gives me enough to mimic and embellish the local moves. My fascination with Bollywood dance probably stems from this too. To watch. To move. The holiday office party. At the Casbah. Dinner and drinks. Dolmades and falafel. Hummus and baba ganouj. Spanakopita and pita. The conversation swirls around to how exciting Madison was in the 1960s, to what dog parks we visit, to designing tattoos and to travel. It’s good to have role models for the future, to mark the point to which we’re headed, to show us that we can keep on going on our paths. For today, she is my spot on the horizon, where I want go. I have a real fear of aging. Of its limitations. Of closed doors and lost opportunities. Of endings rather than beginnings. But sometimes, there’s a crack in that door and the light shines through, and I hear about someone who delights and inspires me to look forward with energy rather than fear. And a Thursday morning addition: After listening to half an hour of news on NPR, I realized I didn't want to start my day thinking about war, so I flipped it off, cranked Mike Doughty's Looking at the World from the Bottom of the Well, and feel much better prepared for the day after a good dance. "That Cuban girl...That brought me low...She had that skin so fine and red lips rose-like now...Her mouth was wide...And sweet as well...And now relentless hours of dreaming up her smell..."
Corgis need to stay busy. Very, very, very busy. So I imagine my dog, during the day, herding his stuffed animals or marching around with the recycling container on his head or making a fort out of a blanket. In reality, he is doing this. I put up my tree early this year. The ornaments are like the rest of the stuff in my house – from everywhere. They remind me of my travels. There are capiz shell ornaments from the Philippines, embroidered hemp from Vietnam, carved safari animals from Kenya, decorated gourds from Peru, and all sorts of things from India. These are masapan ornaments from Ecuador. We often get samples at work of things for our catalog. These are samples which set me off laughing every time they swing ‘round on the tree. Nothing like an ornament that will flash your friends. Needless to say, we did ask for some modifications. Runners up in the goofy product category - a clerical stole that looked like it was created in homage to ZZ Top and a little piece I call Jesus on the half shell. Settling in with the travel section of the Sunday paper, I scanned an article about Ushuaia, the southernmost point in Argentina and the southernmost city in the world. There’s a big picture of snow capped mountains behind a colorful city perched on the water at the end of the continent. It’s touted as a jumping off point for Antarctic expeditions and exploring Patagonia, a good place to drop out of life, eat king crab, drink Pisco sours, and grab a latte. It’s springtime there now. I’m leaving in a couple of weeks on a trekking/hiking trip to Tierra del Fuego that I didn’t plan and haven’t really thought about much. I dug out my flight itinerary, and there, on page 2, is a Christmas Day flight to Ushuaia. The Buddhas, handmade paper notebooks, copper vase, Christmas baubles, and gifts are not yet unpacked from Nepal. Brochures from museums, work notes, Nepalese rupees, and my mail clutter my dining room table. My travel companion is in Venezuela observing today’s election and will have even less turnaround time than I. Today I made no progress on unpacking and organizing as my jet lagged body demanded rest. I am out of context. Out of step. Out of time. Out of synch. Wanting Bollywood videos. Bollywood Barbie. Bollywood Bride. Missing traffic. Traction. Travel. Wishing for gardens in the cool night. Everest beer. Roaring fires. Snow-capped peaks. Architecture. Sculpture. Kathmandu. Patan. Bhaktapur. Carved wood. Carved stone. Carved lives. Did my friends fall in love or were their marriages arranged? Vivid vermilion marked foreheads. Vishnu. Anonymity. Altruism. Annoyances. Imperfections. Recklessness. Fecklessness. When I am out of context. Out of step. Out of time. Out of synch. I yearn. And am left yearning. I'm back and already missing Kathmandu. 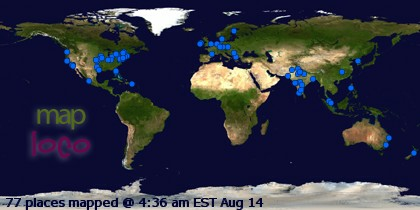 Jet lag is generally worse going east, so I'm anticipating needing a few more days to recover. I left Kathmandu Thursday and stayed overnight in Bangkok. Then I had one of those mega-long calendar days. Seven hours from Bangkok to Tokyo, and another 11 from Tokyo to Minneapolis. One more short flight and I'm home now. Jet lag is supposed to take about one day per time zone, but I've got no idea how many time zones I've crossed and am not sure I want to know. A good friend of mine in Nepal (who, I would mention, is a real inspiration to me) was wearing a cap every time I saw him. I noticed he was going a little salt and pepper in the back, and thought perhaps he was balding or graying at an alarming rate. I learned after spending some time with him that he is wearing a cap because his father died two months ago, at the age of 86, and following tradition, my friend shaved off his hair and is a bit self conscious about it. If he follows tradition, he will shave it once a month for the year. He also will not drink alcohol or eat meat for that year. Having lost both of my parents, I understand the weight of this loss and wish culturally that I had had ways of expressing the grief...of something being physically different in accordance with my loss. I fully believe that in nearly every circumstance, there are many ways to do things. This, I think, is a better way.